The Holland Division was established in 2004 as a separate division of the Soccer Club of Ridgefield to enable boys and girls with physical and mental disabilities to enjoy the game of soccer along with the millions of other children who participate in this sport worldwide. The Holland program is associated with TOPSoccer (The Outreach Program for Soccer) which provides meaningful learning, development, and physical participation opportunities for young athletes with disabilities, organized by youth soccer volunteers. The program is designed to meet the needs of children aged 5-18 years with physical and/or intellectual disabilities. 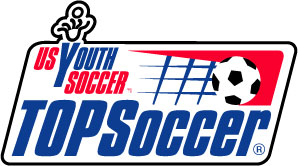 TOPSoccer began in 1991, designed and administered by US Youth Soccer, the nation’s largest youth sports organization. This program fosters the physical and emotional growth and development of America’s youth through the sport of soccer at all levels. It takes kids from the sidelines and gets them into the game. The players will develop a sense of community and will learn what it is like to be a part of a team. The program will improve their social skills, fitness and self-esteem. But most importantly the players will have FUN!! If you would like more information on this program or if you have an interest in being a buddy please contact or .